Batteries are so ubiquitous today that they're almost invisible to us. Yet they are a remarkable invention with a long and storied history, and an equally exciting future. A battery is essentially a device that stores chemical energy that is converted into electricity. Basically, batteries are small chemical reactors, with the reaction producing energetic electrons, ready to flow through the external device. Batteries have been with us for a long time. In 1938 the Director of the Baghdad Museum found what is now referred to as the "Baghdad Battery" in the basement of the museum. Analysis dated it at around 250BC and of Mesopotamian origin. Controversy surrounds this earliest example of a battery but suggested uses include electroplating, pain relief or a religious tingle. American scientist and inventor Benjamin Franklin first used the term "battery" in 1749 when he was doing experiments with electricity using a set of linked capacitors. The first true battery was invented by the Italian physicist Alessandro Volta in 1800. Volta stacked discs of copper (Cu) and zinc (Zn) separated by cloth soaked in salty water. Wires connected to either end of the stack produced a continuous stable current. Each cell (a set of a Cu and a Zn disc and the brine) produces 0.76 Volts (V). A multiple of this value is obtained given by the number of cells that are stacked together. One of the most enduring batteries, the lead-acid battery, was invented in 1859 and is still the technology used to start most internal combustion engine cars today. It is the oldest example of rechargeable battery. Today batteries come in a range of sizes from large Megawatt sizes, which store the power from solar farms or substations to guarantee stable supply in entire villages or islands, down to tiny batteries like those used in electronic watches. Batteries are based on different chemistries, which generate basic cell voltages typically in the 1.0 to 3.6 V range. The stacking of the cells in series increases the voltage, while their connection in parallel enhances the supply of current. This principle is used to add up to the required voltages and currents, all the way to the Megawatt sizes. 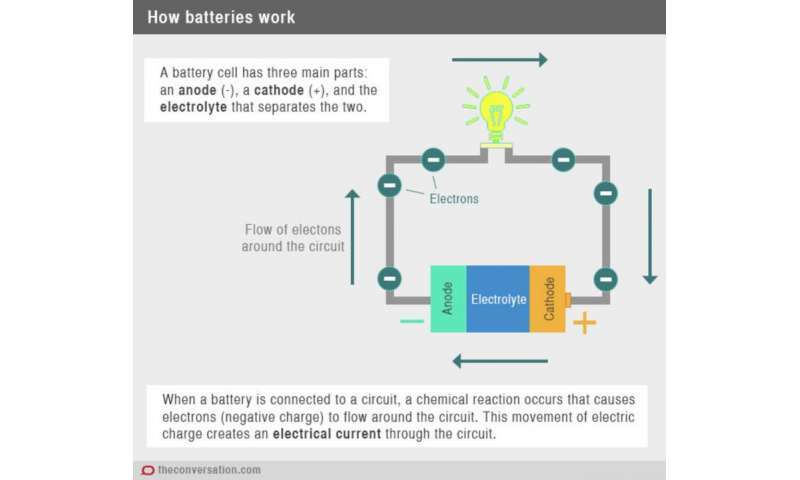 When a battery is discharged the chemical reaction produces some extra electrons as the reaction occurs. An example of a reaction that produces electrons is the oxidation of iron to produce rust. Iron reacts with oxygen and gives up electrons to the oxygen to produce iron oxide. The standard construction of a battery is to use two metals or compounds with different chemical potentials and separate them with a porous insulator. The chemical potential is the energy stored in the atoms and bonds of the compounds, which is then imparted to the moving electrons, when these are allowed to move through the connected external device. A conducting fluid such as salt and water is used to transfer soluble ions from one metal to the other during the reaction and is called the electrolyte. The metal or compound that loses the electrons during discharge is called the anode and the metal or compound that accepts the electrons is called the cathode. This flow of electrons from the anode to the cathode through the external connection is what we use to run our electronic devices. When the reaction that produces the flow of electrons cannot be reversed the battery is referred to as a primary battery. When one of the reactants is consumed the battery is flat. The most common primary battery is the zinc-carbon battery. It was found that when the electrolyte is an alkali, the batteries lasted much longer. These are the alkali batteries we buy from the supermarket. The challenge of disposing with such primary batteries was to find a way to reuse them, by recharging the batteries. This becomes more essential as the batteries become larger, and frequently replacing them is not commercially viable. 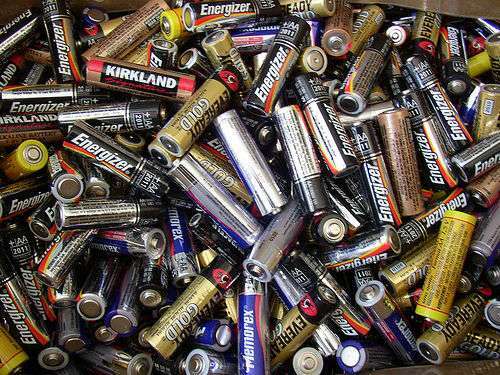 One of the earliest rechargeable batteries, the nickel-cadmium battery (NiCd), also uses an alkali as an electrolyte. In 1989 nickel-metal hydrogen batteries (NiMH) were developed, and had a longer life than NiCd batteries. These types of batteries are very sensitive to overcharging and overheating during charge, therefore the charge rate is controlled below a maximum rate. Sophisticated controllers can speed up the charge, without taking less than a few hours. In most other simpler chargers, the process typically takes overnight. Portable applications – such as mobile phones and laptop computers – are constantly looking for maximum, most compact stored energy. While this increases the risk of a violent discharge, it is manageable using current rate limiters in the mobile phone batteries because of the overall small format. But as larger applications of batteries are contemplated the safety in large format and large quantity of cells has become a more significant consideration. New technologies often demand more compact, higher capacity, safe, rechargeable batteries. In 1980, the American physicist Professor John Goodenough invented a new type of lithium battery in which the lithium (Li) could migrate through the battery from one electrode to the other as a Li+ ion. Lithium is one of the lightest elements in the periodic table and it has one of the largest electrochemical potentials, therefore this combination produces some of the highest possible voltages in the most compact and lightest volumes. This is the basis for the lithium-ion battery. In this new battery, lithium is combined with a transition metal – such as cobalt, nickel, manganese or iron – and oxygen to form the cathode. During recharging when a voltage is applied, the positively charged lithium ion from the cathode migrates to the graphite anode and becomes lithium metal. Because lithium has a strong electrochemical driving force to be oxidised if allowed, it migrates back to the cathode to become a Li+ ion again and gives up its electron back to the cobalt ion. The movement of electrons in the circuit gives us a current that we can use. Depending on the transition metal used in the lithium-ion battery, the cell can have a higher capacity but can be more reactive and susceptible to a phenomenon known as thermal runaway. In the case of lithium cobalt oxide (LiCoO2) batteries made by Sony in the 1990s, this led to many such batteries catching fire. The possibility of making battery cathodes from nano-scale material and hence more reactive was out of the question. But in the 1990s Goodenough again made a huge leap in battery technology by introducing a stable lithium-ion cathode based on lithium iron and phosphate. This cathode is thermally stable. It also means that nano-scale lithium iron phosphate (LiFePO4) or lithium ferrophosphate (LFP) materials can now be made safely into large format cells that can be rapidly charged and discharged. Many new applications now exist for these new cells, from power tools to hybrid and electric vehicle. Perhaps the most important application will be the storage of domestic electric energy for households. The first mobile phone had a large battery and short battery life – modern mobile and smart phones demand smaller batteries but longer lasting power. The leader in manufacturing this new battery format for vehicles is the Tesla electric vehicle company, which has plans for building "Giga-plants" for production of these batteries. The size of the lithium battery pack for the Tesla Model S is an impressive 85kWh. This is also more than enough for domestic household needs, which is why there has been so much speculation as to what Tesla's founder Elon Musk is preparing to reveal this week. A modular battery design may create battery formats that are somewhat interchangeable and suited to both vehicle and domestic applications without need for redesign or reconstruction. Perhaps we are about to witness the next generational shift in energy generation and storage driven by the ever-improving capabilities of the humble battery.